In 2012 on a journey to Nepal, I was quite fortunate to have taken one book with me, finding it to be an excellent support in my down-time while there. Amidst the many difficulties facing the people in Nepal, and my own experience there, I found sanctuary in the commentaries on The Bhagavad Gita, by Ram Dass. My intention for this article is to simply share some of the ideas presented in his book ‘Paths to God,’ like Ram Dass himself, is a real gem, and I highly recommend a full reading of it. These ideas feel important to me, in being aware of the degree to which my mind attaches to the thoughts that I cling to; the thoughts that create and colour the way I experience life. I want to be aware of the world I am creating, and wish to avoid being separate from a wholeness available in Spirit. I also regularly question if I am giving enough time to let go of my clingings and to open myself to these available states of higher consciousness. It is important to me that I am not merely maintaining an ego “comfort zone,” rather than a more true openness to the Divine Love and Truth. It is my aim to steer myself towards becoming one with a greater Flow of Life; in the living Heart, the Eternal Tao; Life Divine. Ram Dass writes that these states of consciousness are always available to all of us in a “spiritual path of engagement in the world rather than withdrawal from it” (23) suggesting that we “extricate ourselves from that entire web of thought forms” that we have created around ourself. The thoughts that we do not let go of easily. Even if we experience deep suffering and pain because of our clinging to them. In the Bhagavad Gita Krishna says to Arjuna: “I have no work to do in all the worlds, Arjuna, for these are mine. I have nothing to obtain, because I have it all. And yet I work.” So the work becomes not for self, but for service to the good-of-all. Live in the moment and give your gifts to the world. Give ‘without counting the cost’ and never lose yourself in calculating what you might receive for your giving. Giving without attachment is to truly give. Many of us try to control life; it is the way of the ego-mind. In an attempt to only experience what we are comfortable with, we resist the flow of life and experience, instead of peace and joy, the pain of that resistance. We experience what we think is safety and comfort but we trade these illusions for our true inheritance. One of the main things that I am experiencing lately, is a continually increasing appreciation of the nature of life; the incredible design of it all. The patterns and relationships. The immense variety and vastness, complexity as well as pure simplicity and joy. The joy of opening to Spirit and allowing myself to feel at One with all that is. To feel my oneness in spirit, with a group of people, as we each open to an ever present flow of life force. The experience, available to all, when the usual mental chatter quietens. In the Eternal Now there is a “freedom from both space and time” (104) We are freed from the usual constraints that may pressure us. We discover new worlds, beyond the chains of our own making; we choose anew. Ram Dass writes that “True giving is dwelling in a state of spontaneous compassion, dwelling in the open heart space.” (259) A space where giving and receiving happen naturally; where giving is done as “pure action” without any ego motives present. 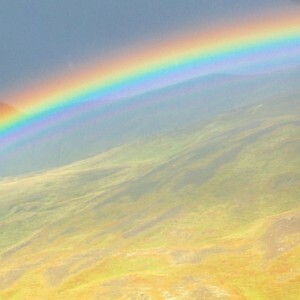 The giving being spontaneous by dwelling in the heart centre: letting Life flow through you. In realising the joy in giving to the good-of-all, I am more easily able to go beyond the fears and constructs of my ego nature. Sacrifice “awakens us to the fact that we are part of a process, part of a divine play.” (111) It takes our mind off our own petty concerns, fears and distractions and helps us become part of something much greater. Ram Dass speaks of renunciation as being about “release, and not self-denial” (136) and in this renunciation we are released from the whole drama that our ego engages in, in how ‘spiritual’ or ‘giving’ we might think ourselves to be. So, in the practice of just ‘letting go’ keeping our motives pure and our surrender unto Life / the Divine through becoming at one with it. It is natural for me to cling to thoughts that create my world; and give energy to finding meaning and avoid suffering; yet in life in general there is Creation, Preservation, and Destruction. Each of these as much a part of the Divine Plan as any other experience. 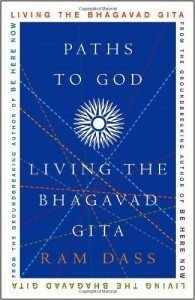 ‘Paths to God: Living the Bhagavad Gita’ (2004) Ram Dass, Three Rivers Press, New York. ‘The Search for Happiness’ (1961) Annie Besant, Theosophical Publishing House, Adyar, India.